This Inflatable Pirate Chest Cooler is a real treasure! 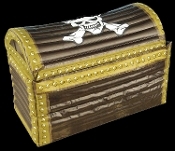 Rustic look Blow-Up Pirate Chest Prop with Skull and Crossbones on the top. Inflatable treasure chest works great as a party accessory, and also as a drink cooler to serve canned or bottled beverages, as well as jello shots! Spice up a Halloween, pirate or luau themed party by adding a Skull and Crossbones embellished brown woodgrain-look pirate chest as a cooler or display decoration. PVC Vinyl. Repair kit included. Inflated size: 25-inch long x 13-inch wide x 18-inch deep (62.5x32.5x45cm).